Sadie and Robert. With her mother dead and her father missing, poor Sadie is working hard to provide for her sisters. Her first love and best friends uncle, Robert, as returned to the island. He secretly (or not so secretly) provides a place for her to live and money for her to use at the store. But he still seems more interested in his actress friend. There is a fire, a kiss, a declaration of love, then nothing. My heart ached for Sadie. Near the end, Sadie has a Cinderella type experience with an unknown fairy godmother. Robert is left speechless when he sees her. Will there be a happily ever after? This is a be true to your heart story with many surprises. I have to say this is its own story but it is also a companion to My Heart Belongs on Mackinac Island, I love them both. 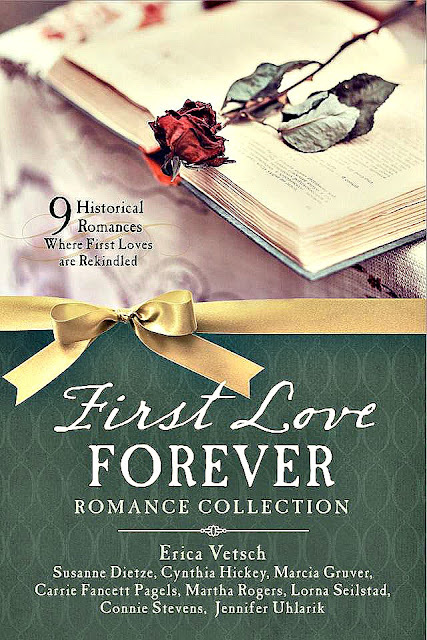 Giveaway: A copy of First Love Forever to one of our commenters (paperback copy -- can be personalized to the winner!) 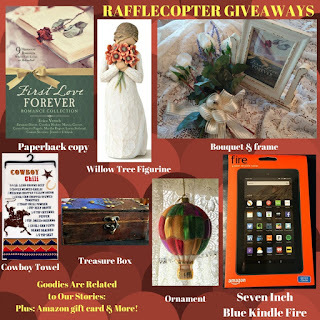 Don't miss out on the monthlong Rafflecopter giveaway, too -- be sure to enter. Hi Jan! I think you will like this story. Be assured, Sadie works hard for everything she has. I had fun putting Sadie's special fairy godmother in there. Definitely interested if this is a follow-up to MHBOMI! This is a wonderful companion to MHBOMI! It's Sadie's story. I loved it! Sounds like an awesome story. It is Nancy! I hope you get to read it soon. Make sure you enter the Rafflecopter for a chance to win the prize pack. If you click on the picture it will take you there. It's a really good collection of stories. I think you will like them Amanda. One of my wish list books, thank you for the chance to win a copy!!!! It was on my wish list the moment I heard about it. I loved each novella in the collection! The book itself is beautiful too! It is a wonderful collection! I loved each story! I just started this collection, it's wonderful! I hope you love it as much as I did Heidi! This sounds like a great story, and you know I love the Barbour collections. I like that this is your story and is a companion to My Heart Belongs on Mackinac Island. That was such a good book. I love the Barbour collections too Susan. They have introduced me to so many wonderful authors. This story is great! I’m about halfway through Maude’s story, so I can’t wait to read this one. A Cinderella story for Sadie sounds like a super good read! I'm so glad you are reading Maude's story, Perrianne. I loved it! His Anchor is such a good story too. Hi Perrianne! I'm wondering if my Pals members ALL know who the fairy godmother is! Hi, Ellen. I love the Barbour collections for meeting new authors. Make sure you enter the Rafflecopter for a chance to win the huge prize pack. Good luck! I loved your first book in this series. I know this next one will be great too. Hi, Sally. I'm glad you loved My Heart Belongs on Mackinac Island. I did too. I'm sure you will like Sadie's story as well as the other novellas in the collection. This will be like visiting a friend. Sadie’s story. Can’t wait! It was like visiting a friend Brenda. A couple of the other novellas are stories of friends from the other authors books. It was nice seeing them again too. Thanks Brenda and Andrea! I love hanging out with my old friends! Hugs! Oh this sounds like such an amazing collection!! It is a wonderful collection Abby! I'm sure you will love it! Oh, I would love tjis collection!!! Thanx for the giveaway!!! It is a great "love" collection, Jennifer! I know you will love this book Rory! Make sure you enter the Rafflecopter for the prize pack. This story sounds fantastic and I would love to win a copy. I think Carrie is an excellent author and I also have loved her other books. I love the title "His Anchor" - I can't wait to read about it and I already am interested in Sadie. I loved Sadie. I have to agree with you, Carrie is an excellent author. I love her books too. You might recognize a couple other people in His Anchor too. i loved My Heart Belongs on Mackinac Island. and you say this kinda goes with that. i need to get this book. thanks for sharing. I'm glad you loved My Heart Belongs on Mackinac Island Lori. Yes, this story goes right along with it. I'm sure you will love it. The collection is awesome! I hope you get to read it soon. I can't wait to read this! I loved maudes story! I'm glad you loved Maude's story. You are sure to love Sadie's story too. I'm sure you will like the other novellas in this collection too. I think you will like this collection. Be sure to enter the Rafflecopter. I love Mackinac Island! It is such a beautiful place. I would love to read yur book. I've never been to Mackinac Island in person. I feel like I've seen it through books and the pictures Carrie shared last summer. I have always been fascinated with Mackinac Island. I would so enjoy this book! Carrie describes Mackinac Island so well it feels like I've been there. I think you will enjoy all the stories in this collection Mandy. Alison, you will love Sadie and Robert's story! Looks like a wonderful group of authors in this collection! It is a wonderful group of authors. Barbour Publishing has some of the best novella collections I've ever read.